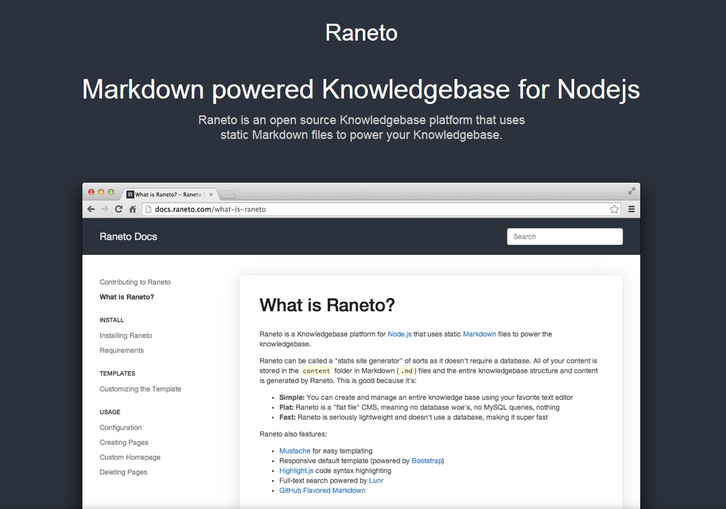 Raneto is a free, open source Knowledgebase platform for Node.js that uses static Markdown files to power the knowledgebase. Raneto can be called a “static site generator” of sorts as it doesn’t require a database. All of your content is stored in the content folder in Markdown (.md) files and the entire knowledgebase structure and content is generated by Raneto. This is good because it’s: 1) Simple: You can create and manage an entire knowledge base using your favorite text editor. 2) Flat: Raneto is a “flat file” CMS, meaning no database woe’s, no MySQL queries, nothing. 3) Fast: Raneto is seriously lightweight and doesn’t use a database, making it super fast.